Everyone knows how much of an advocate we are for designer hire here at The Adelaidian. It’s not often you’ll wear an elaborate dress twice, nor are you likely to rock an extra AF YSL gold clutch on the regular. Hire boutiques really do make life easier for the fashion-forward girl who wants to be on trend, yet lacks the budget to splurge on those up-market pieces. Hello, that’s us! From our previous collaborations with Australian hire brands such as Something Borrowed and Style Secret, we’ve now been keeping an eye out for similar brands while here in London. Recently, we came across Rose Riva UK and decided to undertake a fashion collab with this designer bag hire for London Fashion Week just passed. Borrowing from Rose Riva UK has been a professional and efficient experience, with every detail thought through right down to delivery and cleaning cloths provided. Not to mention, they have a range to die for! While the selection is not huge, it is certainly diverse and versatile to suit a number of different occasions. There’s the trendy street style Gucci Ophidia GG Supreme Shoulder Bag, or the classic Louis Vuitton Trevi, and even the much sought after Chanel Classic Flap. For those wanting something exquisite and unique, the Paco Rabanne Le 69 Iconic Shoulder Bag is an absolute must. Featuring intricate metal detailing that sways elegantly in motion, it’s one to steal the spotlight at any red carpet event. We particularly love that the selection is boutique and not over-saturated with choice; it certainly helped us make our minds up quicker! Mel opted for the shiny luxe Saint Laurent Metallic Kate Shoulder Bag while Kristen chose a chunky Fendi Kan I Nappa Shoulder Bag. These two bags were super fun to style with our LFW outfits, we had fun dressing them up with heels and skirts or dressing them down with streetwear and sneakers. 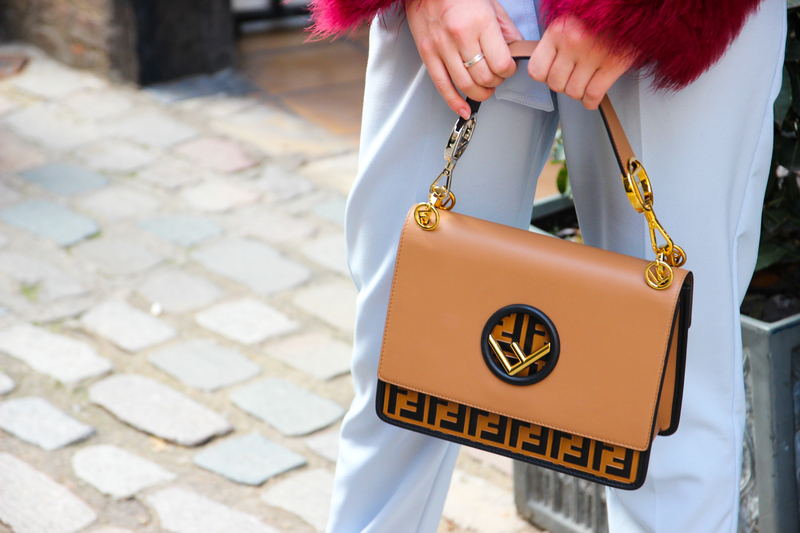 Below, you can suss a little lookbook of our LFW Day Two outfits featuring the fab bags. Thank you to Rose Riva for lending your bags to us for a week! We’ve absolutely loved working with you and hope to collab again in the future. If you live in the UK and want to try this fab service out, you can use out code ADELAIDIAN20 for 20% off bag hire! The code is valid for use until the end of September.